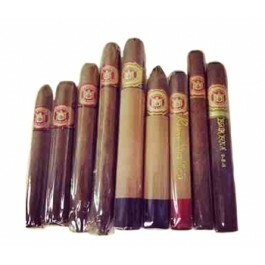 This 9 cigar sampler includes 9 terrific Arturo Fuente cigars from accross multiple Fuente lines, chosen from the best cigars we have in stock when you place youir order. Our latest Arturo Fuente Sampler is the Fuente Range Sampler which includes cigars from accross the range of terrific Arturo Fuente cigars, including the highly sought after Arturo Fuente Anejo line. This 9 cigar sampler includes 9 terrific Arturo Fuente cigars from accross multiple Fuente lines, chosen from the best cigars we have in stock when you place youir order. 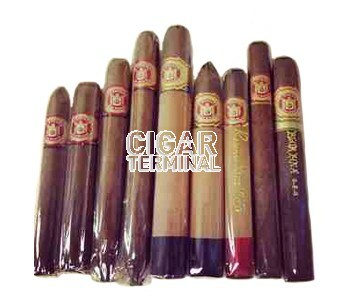 Typically included will be the Don Carlos No. 4, a Don Carlos Robusto, the Hemingway Signature & Classic, a Double Chateau, a Chateau Cuban Belicoso, a Chateau King B, plus a Spanish Lonsdale, and a Fuente 8-5-8.